Had to attack this job recently due to a stuck door lock and noisy central locking on the passenger door. 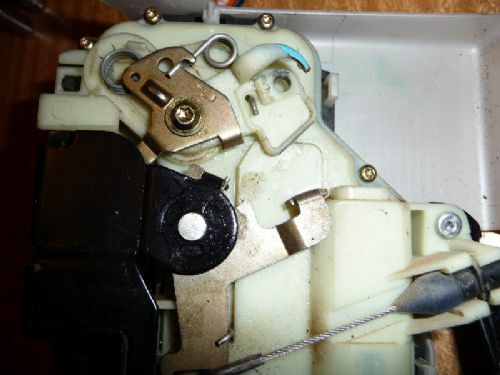 - did not find it necessary to remove window switch, just disconnected the electrical connector once the trim was clear. - pulling the trim off in the region of those clips requires quite a bit of force,almost felt like something would break. 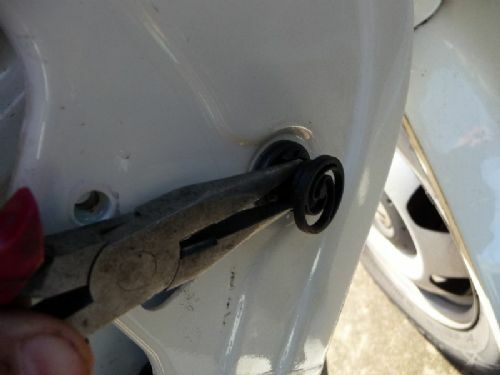 Note:The door steel is quite soft near the clips if you are using a lever and will dent easily.Use padding or a block of wood to spread the load. There are six clips.Some may get hung up on the trim,most stay on the door. Clip positions shown below.There are 3 at front, 3 at rear of trim. I found it easier to reset the clips by driving a double wedge(eg long-nose pliers) sharply between the mountings. - raise the window and support with tape to the window frame.Drop the window mechanism slowly so it is again visible at the access points.Make sure your tape is holding. 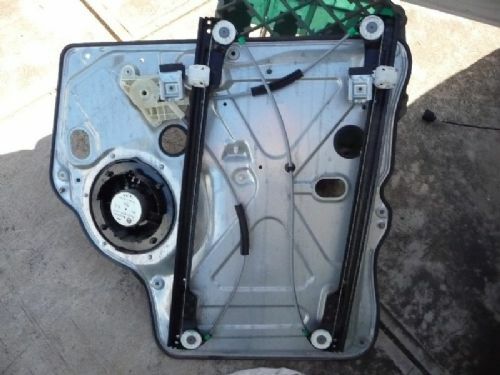 - remove the rubber bung near the outer handle, in the side of the door.Release the torx screw ONLY until the rearward end piece of the outer handle releases.Do not unscrew completely.Remove the rearward piece. - Undo the two multihead screws in the side of the door holding the lock mech. - remove assembly carrier out from the bottom and downwards and rest it on your crate. - squeeze cable clips x3 behind the carrier panel and release them.This will allow the electrical cable to move so you have easier access. - pull all cables through their openings making a note of cable routing behing the panel. - The carrier should now be free. I considered taking the door lock assembly apart for all of a minute,but it does look complicated. Ended up just unscrewing the plastic cover slightly in a few places and a quick spray of lube. - drop the window by hand into the clamps.DO NOT use the electrics to drive the clamps to the window,you will break the plastic slider.Ask me how i know.